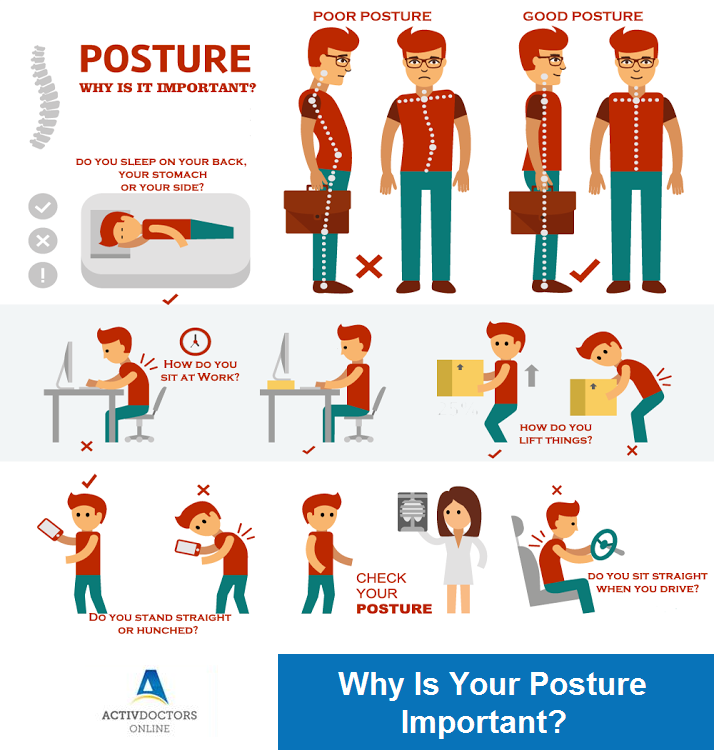 Why Is Your Posture Important? Poor Posture is caused due to adapting a poor posture in everyday activities such as sitting on a chair, staring at the computer, holding a cellphone between your ear and shoulder, prolonged driving and even the way you sleep! Poor posture can easily become a habit which can cause back or neck pain. Fortunately, the factors that influence posture are something we can fix ourselves. Good Posture is when your body is held in proper alignment with your weight evenly distributed along the body. Tummy tucked in with no hip tilt. When spending too long in one position such as sitting, slouching or slumping become evident which in turn puts excess pressure on the neck and back. It is therefore vital to take breaks from positions every half an hour to stand, stretch, walk and change your position. Another easy method to improve your posture is to be aware of the way you’re sitting, lying down. A conscious effort to fix your position can go a long way in avoiding neck or back strain. The benefits of regular exercises are immense, and simple activities such as walking, swimming, etc not only strengthen muscles which in turn help good posture, but also help improve balance and coordination. It is important to use the right equipment or support in certain positions in order to aid and maintain a good posture. Chairs with proper lumbar support, ideal height of the computer screen, distance from the screen to your eyes are simple things to keep in mind. In case you suffer from back or neck pain and suspect your posture being a cause, it is important to meet a specialist to guide you with exercises and rehab specific to your condition. Early diagnosis and exercise shall help prevent future recurrences and the development of chronic issues by reducing the severity and duration of any episode of back or neck pain.